The classic sailing frigate, well-known today for its role in the Napoleonic wars, can be traced back to French developments in the second quarter of the 18th century. The French-built Médée of 1740 is often regarded as the first example of this type. These ships were square-rigged and carried all their main guns on a single continuous upper deck. The lower deck, known as the "gun deck", now carried no armament, and functioned as a "berth deck" where the crew lived, and was in fact placed below the waterline of the new frigates. A total of fifty-nine French sailing frigates were built between 1777 and 1790, with a standard design averaging a hull length of 135 ft (41 m) and an average draught of 13 ft (4.0 m). The new frigates recorded sailing speeds of up to 14 knots (26 km/h; 16 mph), significantly faster than their predecessor vessels. 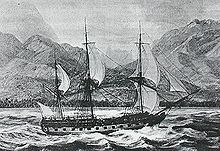 When the seas were so rough that comparable two-deckers had to close the gun-ports on the lower decks, they were still able to fight with all their guns (see the Action of 13 January 1797, for an example when this was decisive). 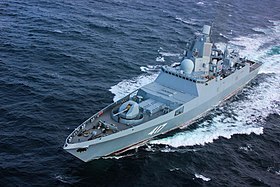 Like the larger 74 which was developed at the same time, the new frigates sailed well and were good fighting vessels due to a combination of long hulls and low upperworks compared to vessels of comparable size and firepower. The Royal Navy captured a handful of the new French frigates during the War of the Austrian Succession (1740–1748) and were impressed by them, particularly for their inshore handling capabilities. They soon built copies and started to adapt the type to their own needs, setting the standard for other frigates as the leading naval power. The first British frigates carried 28 guns including an upper deck battery of twenty-four 9-pounder guns (the remaining four smaller guns were carried on the quarter deck) but soon developed into fifth-rate ships of 32 or 36 guns including an upper deck battery of twenty-six 12-pounder guns, with the remaining six or ten smaller guns carried on the quarter deck and forecastle. From around 1778, a larger "heavy" frigate was developed with a main battery of twenty-six or twenty-eight 18-pounder guns (again with the remaining ten smaller guns carried on the quarter deck and forecastle). 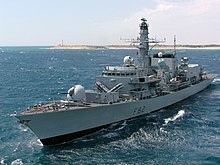 Both British and American frigates could (and usually did) additionally carry smaller carriage-mounted guns on their quarter decks and forecastles (the superstructures above the upper deck). 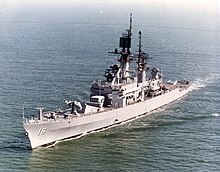 Technically, rated ships with fewer than 28 guns could not be classed as frigates but as "post ships"; however, in common parlance most post ships were often described as "frigates", the same casual misuse of the term being extended to smaller two-decked ships that were too small to stand in the line of battle. Royal Navy frigates of the late 18th century included the 1780-vintage Perseverance class, which measured around 900 tons burthen and carried 36 guns; this successful class was followed by numerous other classes that measured over 1,000 tons burthen and carried 38 guns. 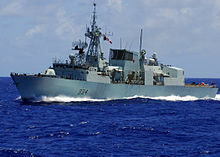 In 1797, three of the United States Navy's first six major ships were rated as 44-gun frigates (or "super-frigates"), which operationally carried fifty-six to sixty 24-pounder long guns and 32-pounder or 42-pounder carronades on two decks; by all regards they were exceptionally powerful and tough. 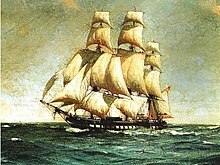 These ships were so well-armed that they were often regarded as equal to ships of the line, and after a series of losses at the outbreak of the War of 1812, Royal Navy fighting instructions ordered British frigates (usually of 38 guns or less) to never engage American frigates at any less than a 2:1 advantage. 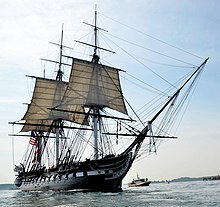 USS Constitution, preserved as a museum ship by the US Navy, is the oldest commissioned warship afloat, and is a surviving example of a frigate from the Age of Sail. Constitution and her sister ships President and United States were created in a response to deal with the Barbary Coast pirates and in conjunction with the Naval Act of 1794. 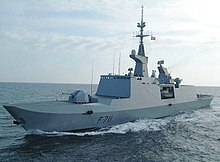 The three big frigates, when built, had a distinctive building pattern which minimised "hogging" (in which the centre of the keel rises while both ends drop) and improves hydrodynamic efficiency. The hull was designed so that all the weight from the guns was upon the keel itself. Joshua Humphreys proposed that only live oak, a tree that grew only in America, should be used to build these ships. The method was to use diagonal riders, eight on each side that sat at a 45-degree angle. These beams of live oak were about 2 feet (61 cm) wide and around 1 foot (30 cm) thick and helped to maintain the shape of the hull, serving also to reduce flexibility and to minimize impacts.